Bugling the Beagle | I Code Raven! The BeagleBoard’s here! Finally! So, after a day of messing around with the board, and trying to figure out how it worked, I am now, typing this very first blog post from within the Angstrom distribution loaded on the board! Woot! In other related news, we had our first flight test this Saturday. 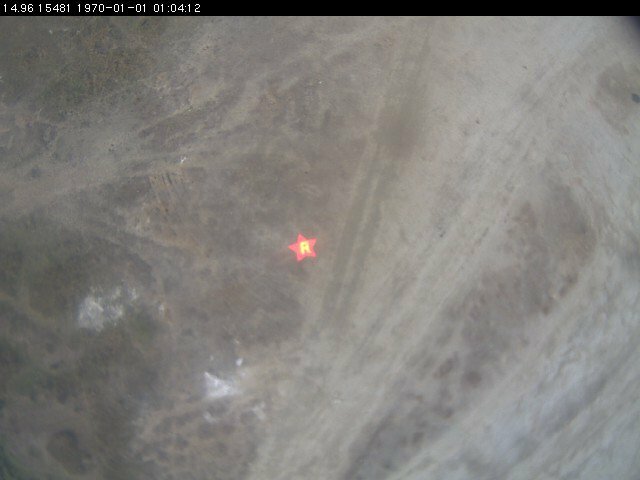 The video feed was pretty good at 640×480, and the targets held up pretty well against the wind, contrary to ahem people’s expectations.Got a decent image of the star target, but the image quality in general was very poor. On switching to 1280 the video feed started lagging, and there was an issue with the antennas as well, so couldn’t test that thoroughly. However, it’s pretty evident that we need a better camera to get those stills. The Axis camera is just not making the cut – We couldn’t get it to focus at ~200ft, there is a LOT of spherical aberration, and the resolution wasn’t acceptable either. So, most probably we will be employing a still image camera in the next flight test, when we’ll couple the beagleboard to the camera. So, back to the Beagle Board. Now, the very first thing was setting up minicom. That was pretty straight forward, and following instructions on the wiki, managed to get the serial comm working. Now the next part was checking the functioning of the board. So hooked up the null cable to the board, and connected it to a mini usb cable, and saw an entire boot up process, that eventually led me straight to a linux terminal (angstrom) over the minicom terminal. Encouraged by the result, I tried running it again with the display connected, only to be greeted by a Kernel Panic, and subsequent hung Uncompressing Linux… dialogs. So, procured the MLO, u-boot and uImage files along with the Angstrom tarball from the Angstrom website. Formatted the SD card in the boot and ext3 partitions, copied the requisite stuff. Put everything together again and voila! The SD Card reader jackets (the micro to SD card converters) are VERY unreliable. DO NOT trust them. Ever. Go ahead with the much simpler and reliable netconnect modems. If obtaining junk characters, check to see if the COM cable is tightly attached, and that the SD card has the MLO file, the uImage and u-boot.bin file in the boot partition. Plug the HDMI to DVI cable before plugging in the power. Also, get a power supply of 5V, and around 2A. An old Axis adapter fit the bill perfectly. Also plug in peripherals before plugging the power. The mini-USB cable is not really required then. Connecting the board to the network is easy enough. In the network connection applet, set the IPs manually, and set IPv6 to automatic. That gets the internet working. #beagle is your friend on freenode. Now, as the beagleboard is up and running, the next task is to get opencv (and consequently the code) working on it. Hm. Also, will probably be looking at building customized boot images of Angstrom. Let’s see over the coming days.